He says he was inspired by President Kennedy's handling of the Cuban Missile Crisis. By Spencer Buell·	 5/16/2017, 10:48 a.m. Moments before Barack Obama accepted his Profile in Courage award in Boston last week, and amid a yearlong celebration of JFK’s centennial, the former president sat down with John F. Kennedy’s grandson to talk about history. 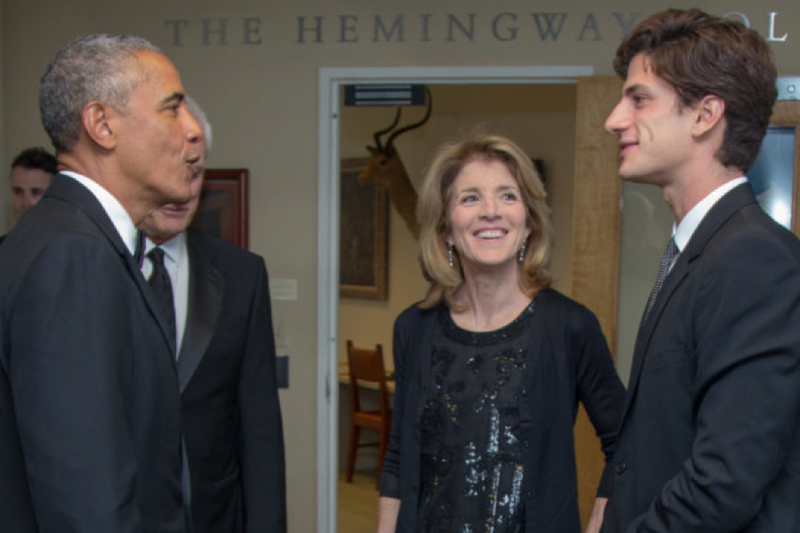 In a brief but wide-ranging conversation with 24-year-old Jack Schlossberg, whose mother is former ambassador to Japan Caroline Kennedy, Obama says JFK’s legacy was important to him during his eight-year stint at the White House. That’s because history matters, he said, and the next generation of government (and, one might argue, the current occupant of the Oval Office) ought to remember that. Case in point: the Cuban Missile Crisis. His comments, of course, came before yesterday’s bombshell news that President Trump had reportedly given up state secrets to Russian officials in what has been characterized a careless slip, and more evidence that ours is a shoot-from-the-hip president who shuns preparation in favor of winging it. He also, as you’ll remember, is prone to messing up History 101. If Kennedy’s legacy, and Trump’s follies, tell us anything, winging it isn’t good for anyone.